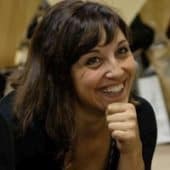 Ángela Ruíz, the Internship Program Coordinator at the School of Architecture and Design, explains how the academic performance of the students has improved amazingly as a result of this professional experience. Read more about the internship program and the experiences of some students in their own words. Summer is not just time to rest and do nothing: it’s an opportunity to focus, to intensify or look further into something that may need more time and energy than you have been able to give. As a teacher, researcher, mum, CEO of a company and architect/designer, summer is a wonderful time to take distance, focus on a task, and put all my energy into it. This year, it’s been spent in the architectural office, but when I was a student, it was an intensive course, a study trip or an internship. There is a time to rest and there is a time to continue acquiring the knowledge that makes you a better architect, a more creative designer and a balanced person. Some people say studying architecture requires a lot of effort, but I believe the only thing you need is passion and to organize yourelf. Studying architecture or design at IE means dealing with different tasks at the same time. One of the strongest gifts IE offers is the opportunity to study and at the same time practise as a professional, thanks to the internship program. The official period is the second semester, combined with studies, and it is an intense period where students work as professionals and study online, managing exams, projects, and many other tasks. Some students, once the internship period is over, decide voluntarily to continue working in these offices full time. Such has been the case this year with Danielle, Gonzalo or Sebastian, three students who decided to continue their second semester internship over the course of the summer. Sebastian has been working at Ingenhoven, a company in Germany focused on designing green buildings. Let him share with you directly his experience. We expect a good academic performance and languages from our students, which allows us to make a perfect match. 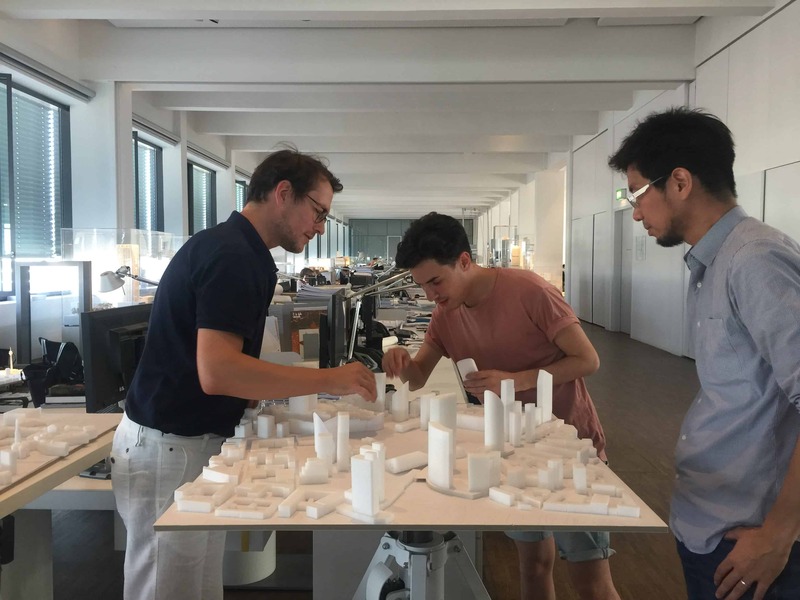 We have sent students all over the world, from Singapore to New York, Japan, Brazil, Jordan, Germany and Mexico, to different destinations that help shape an architect in different fields, not just studios, but also institutions, archives, museums, magazines, as well as engineering or product design companies. As the Internship program coordinator at the School of Architecture, I have had many wonderful experiences with students whose academic performance improved amazingly as a result of their professional experience. I believe internships improve academic performance because it puts into value what students are learning in class, they become more aware of the value of what they are learning, applying structural calculations, physics and the history of architecture. We take great care of the companies we work with so that they are actively involved in the student’s learning, with a healthy balance between the given and the received. The internships are also very important because they make the student feel that they are working on self-improvement, not just on getting a grade or to please a teacher. Instead, they give everything to each project, complying with all regulations, economic requirements and all the variables that define architecture in all its complexity. We also support the internship experience by making the student not only work a few hours a day in combination with their studies, but we also enhance this experience with some questions to make students reflect on certain aspects, such as the identity of the company, its philosophy, the organizational structure of the work and the teams, seeing things in a business context, beyond architecture, and to understand different organizational structures. A platform for the exchange of these experiences will be implemented in October so that everyone can learn from this valuable information, see behind the scenes and keep on learning. We are very happy to see how our students feel fulfilled as architects. That means they are on the right path and are on their way to be successful in life. Now that the new academic year is coming….it is time to think: what next? What do I want to focus on this upcoming year? 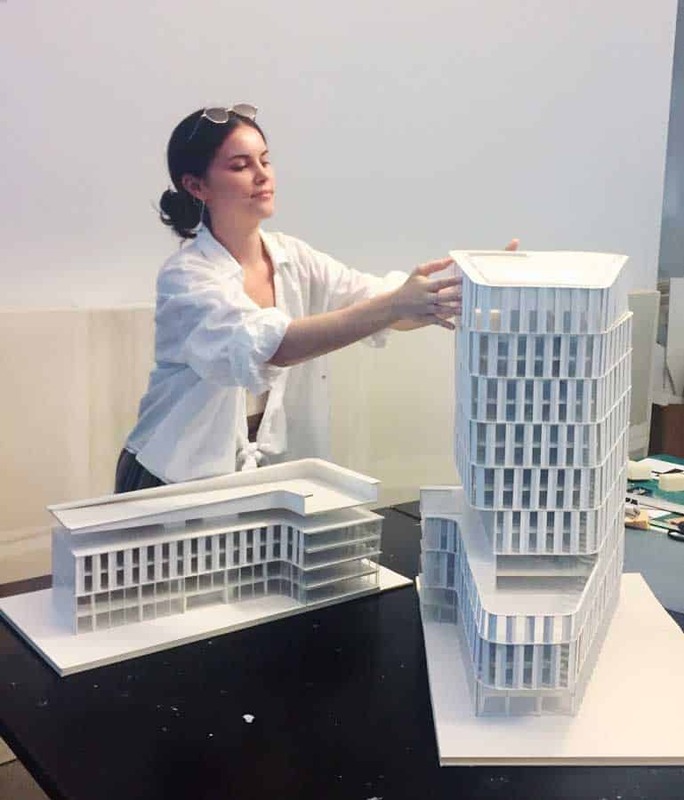 “With just two short years of the Architecture degree program under my belt, I never expected such a hands on and entirely positive experience. Nieto Sobejano Arquitectos has been my absolute ideal first internship, with so much learning and growing involved. There have been many fortunate factors which have contributed to my happiness these short six months; Berlin is like no other I’ve experienced, yet it is so easy to call home. The interns and architects are all incredibly friendly, supportive and international, much like IE’s atmosphere. The tasks given were nowhere near the mundane ones a first timer would expect to receive. I was entrusted with great responsibility from day one. I never imagined having regular discussions with Enrique Sobejano about my work. It was a pleasant surprise to be so quickly and warmly welcomed into the NSA family. “My intern experience this summer has been unforgettable. 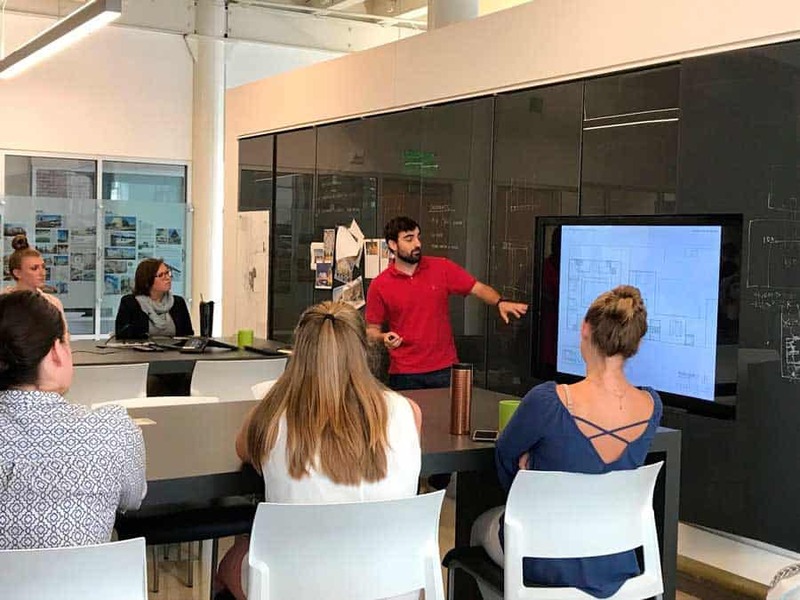 I had the opportunity to spend 6 months studying and working in Indianapolis at Ratio Architects and every day in the office has been an opportunity to learn something completely new. “Six months ago, one evening at around nine pm; I struggled to make myself understood with a taxi driver who only spoke German, trying to reach what would be my apartment in Düsseldorf. It was my first time ever in Germany, and my first time living in a country with a language completely foreign to me. Everything was very exciting. I chose to do my first internship at Ingenhoven Architects, and honestly, had no idea what to expect. In the first two and a half years of architecture, we learned the very basics.. how to design, draw, 3D models, pay attention to detail… how to survive an entire week with less than 4 hours of sleep per night… etc. etc. and I must say that it all turned out to be very useful! (Except for the lack of sleep, at Ingenhoven Architects they don’t let interns work overtime). Ingenhoven Architects is known for its international, efficient, and overall, sustainable, design. It has won many awards, such as Best Innovative Green Building at the MIPIM Awards, or for the highest residential tower in Sydney. I was assigned to work in the competitions section, which contains several teams. The atmosphere was usually fast-paced, with frequent deadlines and submissions . I was exposed to so many ideas and drawings daily; with tons of drawings, models, detail pieces, and renderings scattered throughout the entire studio. During the six months, I worked on around nine different projects. Because it was the competition section, all projects were in their initial phase: determining the main design concept and illustrating it. My tasks varied, depending on each project, and because of this, I was able to exercise a kaleidoscope of different skills. Some of the main tasks I carried out included: learning an entirely new CAD program (Microstation) and developing drawings, embellishing final drawings with Illustrator, creating diagrams of all sorts with illustrator, 3D-modeling building iterations and surroundings, making physical models for building iterations, and using Photoshop to enhance CAD drawings. This work experience gave me a huge insight into environmentally conscious architecture. As I mentioned before, it’s in Ingenhoven Architect’s DNA to create green buildings. To do this, they developed “supergreen”, a concept that consists in being aware of a building’s energy and resources, in all phases. I must say that every single project I worked on incorporated green architecture, usually implementing vegetation in the design as a way of both contributing to the environment and solving certain problems. Often, vegetation served a purpose to protect buildings from noise, sun, and wind. On top of that, other methodologies such as rainwater collectors, photovoltaic panels, and the use of renewable energies were harbingers of a “supergreen” building. In addition to all thing architecture and work related, I was able to meet so many interesting people and share with them many ideas and moments. I was also given valuable advice from many successful individuals and forged numerous new friendships. There are so many conversations I will never forget.